Posted by Edwin Ritter in career, Social Media, Trends. 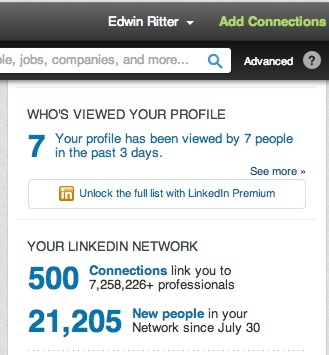 Earlier this year, I was surprised by an email that indicated my LinkedIn profile was in the Top 5 % of accounts viewed. Recently, I achieved another LI milestone as my network is now 500 strong and growing. To my network – Many thanks to all who have connected with me. I appreciate the interactions and look forward to continued knowledge share. I must admit that these connections are largely organic and the result of networking. I had not intended to reach this number. While reviewing my connections, many of them also have networks of 500 or more so I am in good company. Glad to be here with you. Initially, I would connect with any and all on LI. My focus then was on growing the network in the wilderness that once was LI. That changed over time as it increased in popularity. The selection criteria was also a recent discussion topic in another network group I belong to. The most basic way to manage connect requests is to show the value provided in the connection. Don’t assume it is obvious and that I will accept. If I don’t see the value, I won’t accept. As part of the request, where possible, customize the invite message. One change I did not enjoy was getting removed from groups. The message here is if you belong to a group, you should actively participate. If not, LI will remove you due to inactivity. Also, I noticed there is a limit to the number of groups you can belong to. Note – I use the basic ‘free’ account. It may be different with upgraded accounts. I have a fairly robust profile that detail my career changes with recommendations from many people I have worked with the past. I certainly appreciate endorsements (a fairly recent feature) on my skills and expertise and enjoy reciprocating with my connections. I find the profile is better at conveying who a person is and their career achievements and skills. In my opinion, the LI profile is an improvement over the traditional resume. At the risk of repeat, I submit that this profile will have more impact than a traditional career resume. This implies many changes in recruiting need to occur before that is commonplace. It is a direction I encourage as we improve how to digitally communicate. That’s been my journey on LI so far. Do you have a goal for network connections? What are your favorite features on LI?